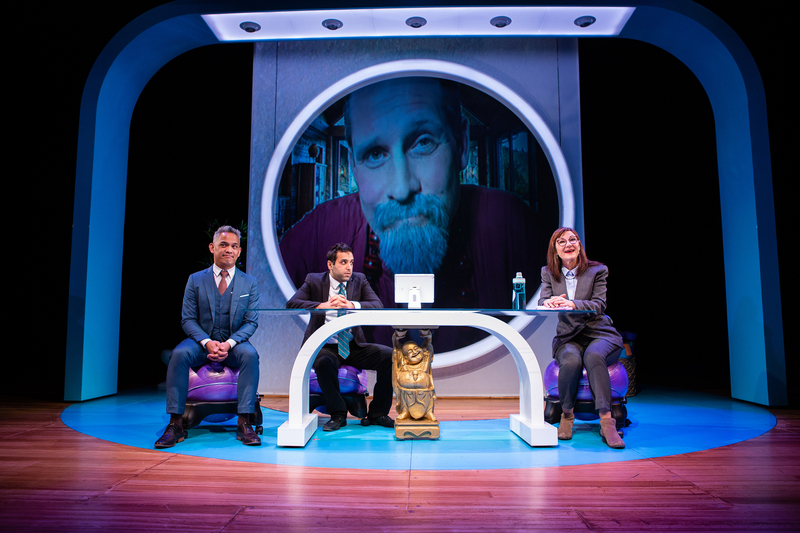 From L to R: Yoga Company executives Fred (Ryan Morales), Raj (Bobak Cyrus Bakhtiari), and Joan (Susi Damilano), Skype with Company Founder John Dale (Craig Marker), in Dipika Guna’s “Yoga Play” at SF Playhouse. Dipika Guna’s “Yoga Play” touches intelligently on important themes such as cultural appropriation, exploitation, consumerism, fat shaming, and workplace abuse. But don’t expect an earnest evening of politically correct theatre. Sure, “Yoga Play” will encourage you to think, but mostly, it’s about making you laugh. And laugh you will. On opening night, many audience members, myself included, were laughing so hard we had trouble catching our collective breath. And why not? We are in good comedic hands with Bill English directing with his usual unerring instinct for emotional clarity and laughter. The play opens with Susi Damilano as Joan, the uptight CEO for the highly successful Yoga apparel company Jojoma, delivering a marketing proposal (via Skype) to owner founder John Dale (Craig Marker). Joan is proposing that the company consider marketing yoga pants in plus sizes, but John has his doubts. Not that he has anything against larger women, mind you, but he points out that his is an “aspirational brand.” In the capable hands of Damilano and Marker, this is not merely funny but absolutely hilarious. Damilano’s barely suppressed rage and frustration, matched by Marker’s incredibly loopy new age entrepreneur spins this clever dialogue into comedic gold. When the point is made that the plus sizes are projected to bring millions of dollars in increased sales, everybody gets on board and a third world factory is quickly fitted out to produce lavender scented plus size yoga pants that will sell for $200 a pair. All is well, until the executives discover that the factory is a sweat shop utilizing child labor. A scandal emerges. Child labor does not fit the New Age brand. Desperate to save the firm, Joan and two other executives, Raj (a thoroughly assimilated child of Indian immigrants played to perfection by Bobak Cyrus Bakhtiari), and Fred (Ryan Morales) concoct a plan. They will find a new spokesman, a genuine Indian Yoga Master whose unassailable authenticity and spiritual force will polish away the tarnish on the Jojoma brand. Except: complications. When the Indian Guru turns out to present unexpected problems, Raj, who doesn’t know a downward dog from a yapping chihuahua, must step up to impersonate the Master. Bobak Cyrus Bakhtiari’s bug-eyed terror as he sets out to fake it could make a stone Buddha laugh out loud. By the time we reach the denouement, “Yoga Play” has stumbled its way into outright farce, all the details of which I will not attempt to describe (too many spoilers), but if you go and don’t laugh out loud, you probably need a funny bone transplant. Lastly, I would be remiss not to mention the uniformly excellent design elements with call-outs to Nina Ball (set), Rachael Heinman (costumes), Kurt Landisman (lighting), and especially Teddy Hulsker (sound design and projections) and Laundra Tyme (wig designer). And, among the excellent supporting cast, Ayelet Firstenberg is a stand out as a stressed out yoga teacher who makes “Namaste” sound like a curse. “Yoga Play” continues at SF Playhouse through April 20th, 2019. For further information, click here. “Yoga Play” by Dipka Guha. Produced by SF Playhouse. Director: Bill English. Scenic Designer: Nina Ball. Costume Designer: Rachael Heinman. Sound Designer: Teddy Hulsker. Lighting Designer: Kurt Landisman. Projections Designer: Teddy Husker. Joan: Susi Damilano. Raj: Bobak Cyrus Bakhtiaqari. Fred: Ryan Morales. John Dale; Craig Marker. Romoa: Ayelet Firstenberg. Guruji: Hrundi V.Bakshi. Mrs. Kapoor, Lucy, Lauren Clark Rose: Ayelet Firstenberg. Alan Carr: Craig Marker. Mr. Kapoor: Hrundi V.Bakshi. Nooyi: Shannon R.Carroll. 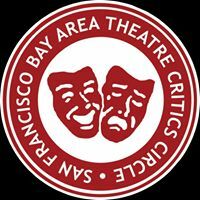 Posted in Reviews.Tagged Ayalet Firstenberg, Bill English, Bobak Cyrus Bakhtiari, Charles Kruger, Craig Maker, Dipika Guna, Kurt Landisman, Laundra Tyme, Nina Ball, Rachael Heiman, Ryan Morales, San Francisco Playhouse, San Francisco theater reviews, Susi Damilano, Teddy Hulsker, theatrestorm, Yoga Play.